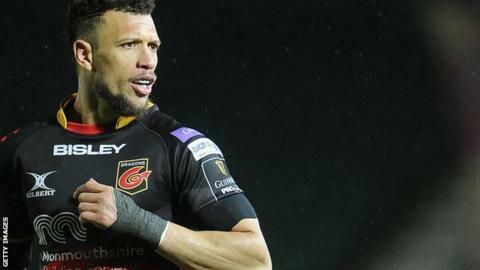 Bristol Bears have signed Dragons full-back Zane Kirchner as a short-term injury replacement for Charles Piutau. The 34-year-old former South Africa international moves to Ashton Gate on a month-long loan. Piutau, who is out until the end of October with a shoulder injury, is joined on the sidelines by fellow full-backs Luke Daniels and Matt Protheroe. "It was important to add a player of Zane's ability," Bristol head coach Pat Lam said. Kirchner's own influence at Dragons has been curtailed by injuries, with the full-back making just 13 appearances for the Pro14 side after moving to Rodney Parade from Leinster in the summer of 2017. Meanwhile, veteran Australian flanker George Smith avoided a suspension at an independent disciplinary hearing on Tuesday and will be free to face Gloucester on Friday. Smith was sent off in Bristol's 44-23 loss at Saracens on 8 September for a "dangerous tackle" on Jackson Wray, but the disciplinary panel deemed that "on the balance of probabilities the initial contact did not involve any direct contact to the head".